Most of the recipes on this blog are created by Lauren and me, which sometimes leads to disasters (note: We don't post those ones! ), but occasionally, I taste something I've made that is particularly spectacular and think to myself, "You are a wizard." Those instances make up for all the recipes that just didn't turn out. 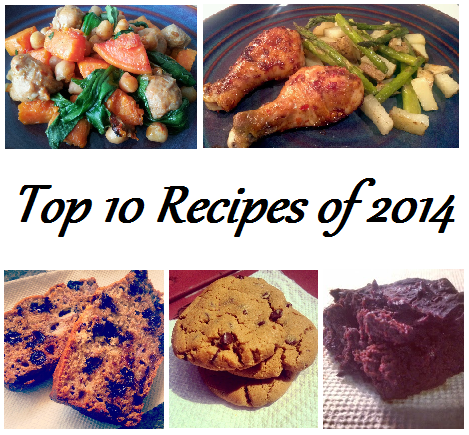 With 2014 wrapping up, we've decided to make a list of our favourite recipes from this year. Who doesn't love breakfast that tastes like dessert?? And what's better when its made from healthy ingredients that will keep you full and satisfied all day long?? The perfect combination of sweet and spicy! This chicken was so lick your fingers delicious! The perfect side to any meal, plus they make an excellent snack the next day! These cookies are so delicious it was really hard to eat just one or two! My all time favourite banana bread recipe! This recipe blew my mind because it means I can have lasagna without having to cook the meat and pasta before assembling it. I tried it with chunky vegetables and with food processed vegetables mixed into the ground meat and both versions were great. I've also made it with ground chicken and with ground beef. The winner was ground beef. This one was so good, I also made a slow cooker version. It reheats well in the microwave and we've even had the leftovers for breakfast before. It's packed with protein and fibre, so it will keep you full. Any food that provides me with an opportunity to pile fresh guacamole on top of it is a winner in my book. I had a power outage in the middle of cooking this and it still turned out perfect, so I think it is impossible to mess this one up. Mashed avocado in baked goods provides all the fatty goodness of a cup of butter in fruit form! What could be better than that? Fresno chilies and fresh basil from my potted plants provided the inspiration for this recipe. It works well on chicken, pasta, flatbreads, etc. Jars of homemade pesto make great homemade gifts, so if you have a food processor, I highly recommend this one!